Beautiful Annasul Y Snow Dress. The dress is made to a really high standard with beautiful Lace detail, which is then highlighted with the intricate beading detail on the top/bodice of the dress, this is also then detailed at the bottom of the dress/train. The dresss has a Silk slip underneath with then one layer of mesh/chiffon and then another layer over the top which then leads into the beautiful long train. As you can see the dress has build in bra cups. The colour is cream/off white, ive tried to show you the beauty in this dress but it really does look more exquisite in person. The dress was a sample, but in excellent condition. 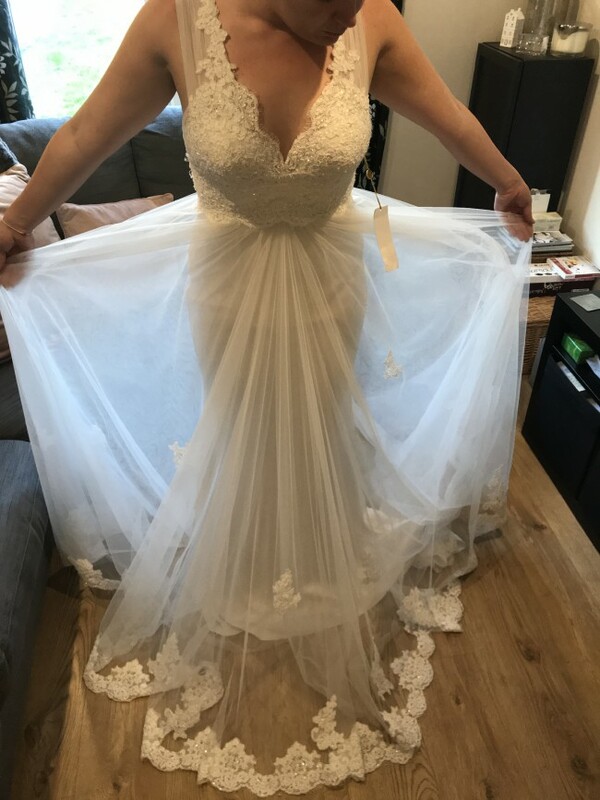 Please feel free to ask any questions :) I’ve tried to capture all elements of the dress in photos. I’ve purchased and alternative dress that suited my style better, hence reason for selling this one.